They grow up so fast! 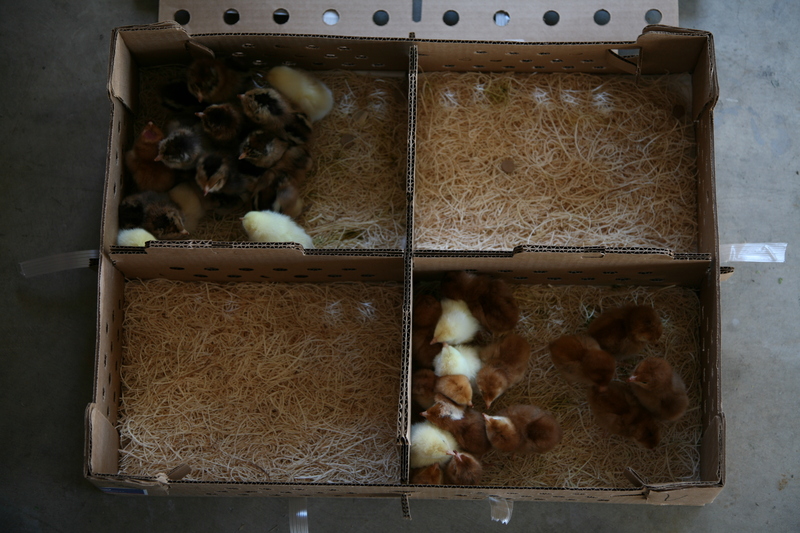 Just a few days ago, they were in eggs that would have fit neatly into this box. (Now they’re really free-range.) Only six days old, the chicks are already stretching their wings. The brooder has become a runway: the girls take turns racing up and down the box lengthwise, seeing how many of their sisters they can clear in one fast-flapping leap. The only real hazard, so far, with the chicks: they take up a ton of my time. Sure, some of this is necessary — I’ve had to pick poop off a few pasty butts, plus they’re constantly filling their waterer with pine shavings, and they’re always on a mission to drench the brooder that’s supposed to stay clean and dry — but some of it is pure pleasure. If you’ve never chick-watched, a word to the wise: it’s like Desperate Housewives, only cuter. They scratch in the bedding, quibble over kibble, fall asleep haphazardly — on the feeding trough, under the feeding trough, or in adorable little chick-carpets, all the sisters intertwined — and beat their tiny little stumpy wings so hard they almost outsmart Bernoulli and fly. The funniest thing happened when Emmett and I were playing with them this evening. His cell phone rang. All of the chicks simultaneously jumped up, then went silent. The phone rang again. A second jump, higher this time; then they went immediately into a duck-and-cover drill. Three quarters of them went to one end of the brooder, a quarter went to the other. Moving as one, they dropped to the ground, packed tightly together, and pretended to be asleep. A few happened to end up on Emmett’s hand; he lifted his hand, and like stubborn little opossums feigning death they refused to move. It was the strangest thing — some evolutionary adaptation, I’m guessing. Perhaps the ring happened to be the same note as a hawk’s cry? American man can keep farm in Saskatchewan, after all — although his children won’t necessarily be able to inherit it. With that, Emmett and I took off for the post office — which isn’t technically open at 7:45 a.m. Per the postal worker’s instructions we went around back to the loading dock, where dozens of post office trucks lined up, their drivers just beginning to trickle in for the day’s deliveries. I found a friendly truck driver who bustled through the “Authorized Postal Workers Only” doors to locate my chicks. Before I knew what was happening, I found myself holding a rather unusual cardboard box — one festooned with breathing-holes and cheeping loudly. I rattled off the names: Rhode Island Reds, White Leghorns, Araucanas. “I take it you’re a chicken fancier,” I said, a bit surprised by the deluge of advice. One by one, we moved the birds from the cardboard box into the brooder, dipping each chick’s beak into the waterer so it would know where to get a drink. We didn’t have to tell them where to find the food — they immediately starting attacking the miniature trough, pecking like their little lives depended on it. At first, none too shy, a few of them squeezed the greater part of their little bodies into the trough’s feeding holes like little burrowing chick-gophers. We quickly learned to fill the trough up to the very tip-top so they wouldn’t wriggle themselves in and get stuck. Now some of the babies are sleeping, others are clambering on top of the sleeping ones, still others are eating or drinking or exploring the farthest reaches of the brooder. Already I can tell that the different breeds have slightly different personalities. The leghorn chicks (yellow) are pretty laid back. The Rhode Island Reds (ruddy) are feisty, sassy little things, prone to climbing right over the other chicks and/or trying to eat their sisters’ wingfeathers. (Within fifteen minutes, the chicks had managed to upset the waterer, forming a paper towel swamp and forcing me to transfer all the chicks to our back-up plastic tub. I blame the RIRs.) The Araucanas (black & brown beauties) are somewhere in the middle, and seem particularly content to be hand-held. I’ll keep you updated on their progress over the next few weeks, and offer any tips or lessons learned in case you find yourself ordering some baby fuzzy butts in the near future. (Warning: they’re addictive. Watching chicks is kind of like watching TV, only better.) For now, I just hope they get big enough, soon enough to eat our surplus crop of chard and beans while the plants are still producing!